Who exactly is your website for? Do you know anything about the people who are visiting your website? For that matter, do you know anything about your customers? What age are they? What are their priorities when buying a car? What are their aspirations? Where do they live? The 5 W’s are often used by journalists and writers, but are often forgotten in marketing. 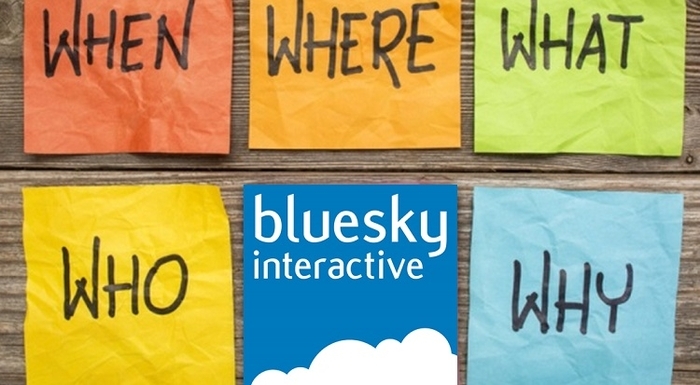 However, here at Bluesky we believe that Who, What, When, Where and Why are the key questions you should be asking yourself when making digital and website decisions. By answering some (or hopefully all!) of these questions we believe you can build a more appropriate and targeted website, hopefully having an effect on how well it then performs. Who is your customer? Are there certain trends or profiles of people that are more common customer types than others? It is likely that, dependant on the franchises you have or location you are in, there will be key demographics that make up a significant percentage of your customer base. Whilst we don’t want your website to be alienating to people who aren’t from your demographic (and making assumptions about your customers is never a good idea), we believe that identifying a selection of key “Who” profiles can help to target your activities. For instance, after researching your customer personas you could find out that housewives and first time buyers are your key audiences. A bit more digging shows that first time buyers are very mobile friendly with a strong emphasis on social proof, so you make sure your website is tap-friendly, and add social media options throughout. Meanwhile, the housewife research reveals that she is interested in safety, convenience and practicality, so you make sure to demonstrate these key details more prominently on your new and used car pages. This may sound silly, but what are your customers on your website for? If you sell vans as well as cars, are people there for the commercial vehicle offers? Is aftersales actually a major reason for visitors to return to your site, wanting to book in for their first MOT? Assuming that new and used cars are all that matter on your website is taking a big gamble, and we’d always advocate doing a bit of digging (and speaking to customers) to make sure that their other needs are met too. This might mean having a big servicing button on the homepage – or enhancing the vans section of your website to include more than just a few static pages. A quick one, but worth looking into. When are people coming onto your website, and when do they want to enquire? In London, for instance, city culture means that people don’t just browse in the evening, but expect to be able to get in touch – meaning you need to consider Out of Hours solutions, or clearly communicate how fast they can expect a response. In more rural areas, however, whilst people may browse in the evenings, you may discover that they tend not to enquire (or expect a response) at those hours, instead preferring to shop your site without any added pressure. This knowledge can have a big impact on how you choose to manage your Live Chat and phone calls, amongst other things! Google Analytics can help with this question a certain amount – showing you a geographical idea of where your customers are based. It’s not perfect (lots of people will show in London or have incorrect locations set up), but it certainly gives you an idea. Why do you need this knowledge? Because there is a very different approach needed if all your customers come from your village to if they are shopping your website nationwide. If you have a national coverage, it may be important to put more emphasis on your Free Nationwide Delivery offer, or explain to customers why they can trust you. To prevent them driving hundreds of miles to be disappointed, you may want to consider used car videos, or upping your photo count to 12 rather than 9. For local customers, however, it may have a positive effect to focus on your local heritage – how long you have been a source of employment, the fact you are family based and a part of their community. Different information can help to persuade these very different audiences. Related to “What?”, this is the last key W question that you should ask. Hopefully by this point you already know what they are on your website to find – and you can expand that question to ask why they are there. Are they trying to find a new family car? Are they after something sporty and a little bit ridiculous? Maybe they’d never have considered a new car before but know that there are good finance deals that have made it into a possibility. Are they hoping to book a test drive, or do they want to be told what car will suit them best? Maybe they don’t know why they are there, and are ripe to be persuaded into one of your more tempting deals. These questions are harder to identify than many – and whilst some of these categories will have strong trends there will likely be an awful lot of answers. However, this is your chance to see if your website meets their needs. If they want to part exchange their old car, is there a CAP Valuations module on your site to make it happen? Have you sorted your cars by bodytype or lifestyle choices, as well as by make and model? Is your copy persuasive and sales-focused? If you look over your website, do the research and discover that it doesn’t seem to be meeting the needs you’ve highlighted, then we’d suggest the time has come to consider a redesign - one that takes your objectives and builds a completely bespoke website around them. It should meet not only your needs, but those of your customers, and nothing less will do. Bluesky Interactive have been producing bespoke, template-free dealer websites since 2002, combining the latest technology with award winning customer service that puts you first. To find out more, call them on 0845 415 4853 today.